Page Manager, the new app recently released to help businesses create a stronger presence on Facebook, is now available for iPhones and soon for other devices. 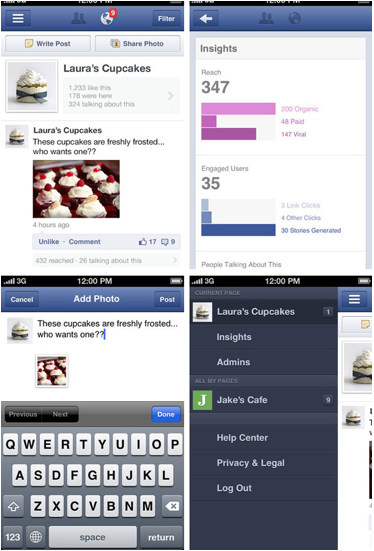 It allows users to manage all of their Facebook pages in a single app wherever they go. There are many strengths and a few weaknesses. Let’s cover them. Facebook Page Admins have a chance to separate their personal Facebook account from their business Facebook pages. Users can leave their personal account on the normal Facebook app, and use Facebook Page Manager for pages built for their businesses. Make new posts or add a photo for up to 50 Facebook pages in a single app without needing to sign out and sign back in over and over again. Get notifications for activity on your page as it happens, and be able to delete or like the comment or post right away. Look at your page insights and page administers for all of your different Facebook pages. Greatest benefit: Do all of this on the go through your mobile device! Cannot create an event, question, or milestone for your pages. Insights are limited to Total Likes, People Talking About You Page, and Weekly Total Reach. Absence of a newsfeed, which makes it difficult to share other pages or posts. Lack of an option to view and reply to messages. At launch, Facebook Page Manager is missing plenty of features. But it’s already an essential app, and one that will likely get better over time as it gets updated. It’s free to download, so try it out if you’re an admin of multiple pages.